"The Lesser of 2 Monsters"
The monster is Mother Herd, a former foe of Alpha Centurion. The heroes are Doomed, Alpha Centurion and Superman. Mother Herd begins a fight with the trio birthing smaller clones to aid her. With Doomed doubting himself the fight is down to Clark and Roman but without the 'Pantheon of Grace' (a mysterious weapon Alpha Centurion had previously used years ago) the fight is a losing battle. When Doomed regains a little confidence he rejoins the fight and helps push Mother Herd and her babies to the riverside. The monster then picks up a nearby ship and smashes it down on the trio of heroes. Elsewhere Reiser's Aunt is walking her dog Oui Oui when civilians race away from the fight and warn everyone to run away from Mother Herd. Oui Oui realizes Reiser is in trouble and races to help him. Reiser wakes underwater and sees Clark pinned under the ship wreckage. As Clark begins to black out, drowning, Doomed pulls him free, grabs what is left of the ship and uses the sharp edge to decapitate Mother Herd. Crawling out of the water with Clark he is then faced with Alpha Centurion. The faux god tells them he is a hero that fights monsters and despite his heroics, Alpha Centurion swears that he must still die. Centurion is sucker punched by Clark who also turns on Reiser but with the intention of taking him back to S.T.A.R. to undergo tests. Out of nowhere Reiser gains the ability to speak in his monster form and transform back to human at will. Reiser points out that Clark chose to be a hero, despite the fact half the world hated and feared him and the other half loved him. Clark above all chose to be Super, to use his gifts for good. He chose to try and make the world better and he asks Clark why he doesn't get to try to do the same thing? Superman isn't convinced that Reiser is genuine but when he sees Oui Oui run onto the scene and shower Reiser with kisses, he tells the teen that if a dog loves him, he can't be all bad, but he'll be watching and waiting to see that Reiser lives up to his promise to use his powers for good. As Clark takes a knocked out Roman away with him, Reiser grabs Oui Oui, changes into Doomed and leaps into the sky. 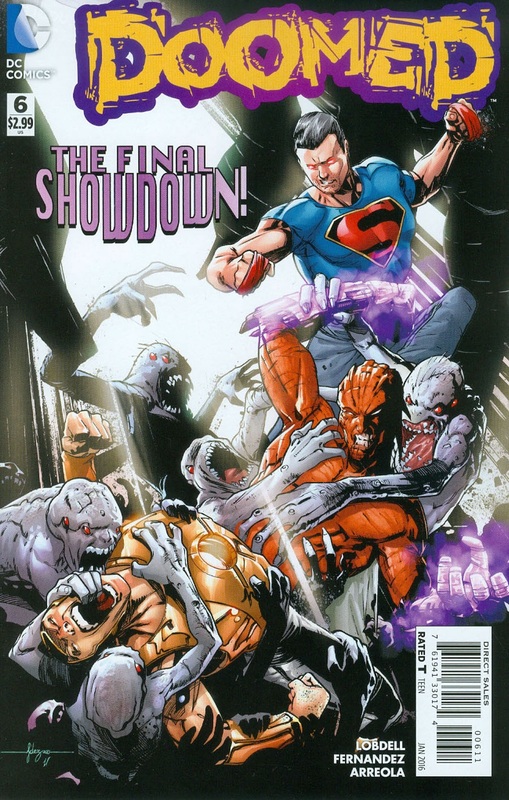 The End - Doomed will continue as a member of the Teen Titans as of issue #14. Story - 3: Superman believes if a dog loves you, you can't be a villain! This rushed finale ties nothing up, the angst that has been ever present fades and Reiser suddenly gains the ability to control his powers and speak in coherent sentences. Considering the direction the book was taking over the past five months and the character development, it seems odd to deliver such an unsatisfying finale. It's obvious that the book was killed off before the storyline was finished but if there are fans of either Doomed or Teen Titans I guess they will be happy to know Reiser will be a Titan from now on. Just last month Superman was worried that Reiser is a carrier of Doomsday spores but I guess it doesn't matter anymore. A forgettable series overall though the speech from Reiser about Clark's past and growth as a hero was the only worthwhile scene. I am curious as to how he will fit into Teen Titans, not enough to read it, just enough to... wonder. Art - 4: With no comedy element besides the dog, the art finally took itself seriously and was all the better for it. The decapitation, the big fight finale was confusingly neglected or worse unclear, I'm not sure if it was a rushed deadline or poor composition but the end of the fight was vital to show and it was odd that it was handled as it was, i.e., not at all. Cover Art - 3: Not exactly a stellar effort for a cover. Superman looks odd physically. The series has had a strange series of covers uneven in score. Prior to the book's merciful cancellation the cover was originally Reiser and Roman playing video games, so this published cover was actually worth replacing that one.